CSUS opera workshop presented Kirke Mechem's Tartuffe. Wikipedia says this opera premiered on May 27, 1980, at the San Francisco Opera, though there is no mention of it in the archive and I was a season ticket holder at the time. My memory consultant says this would have been Spring Opera, a second tier company that existed at the time. It is a number opera with arias and ensembles, and makes an excellent opera for an opera workshop because many of the roles have musical substance. Our performance was accompanied by a full orchestra from VITA Academy conducted by Brian O'Donnell. The theater department provided the production, as was always the case in my day. 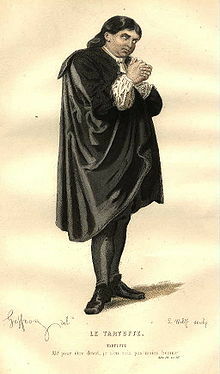 The picture above looks a lot like our Tartuffe except ours had much thinner legs. This was fully staged and not semi-staged as advertised. Dorine is a distinctively Despina-like character who gives advice and noses in on pretty much everything. The opera is after the play by Molière which is subtitled "The hypocrite." He pretends virtue while conning people out of their wives and goods. It was censored by Louis XIV to please his archbishop. Orgon is fascinated by the very virtuous Tartuffe whom he sees at mass. Then he invites him to live in his house. Everyone in Orgon's family hates Tartuffe. Orgon announces that Mariane will marry Tartuffe which brings the action to a head. It has a happy ending. It would have benefited from some improved diction but was fun. The composer was clearly interested in writing music for operatic singers, something that is not all that common in the post-Puccini world.